In his English-language directorial debut, Belgian helmer Michaël R. Roskam (Bullhead) tackles much-adapted author Dennis Lehane in a simple, moody crime drama set on the mean streets. Lehane’s short story source “Animal Rescue” took place in Boston, just as his Mystic River, Gone Baby Gone, and Shutter Island did. 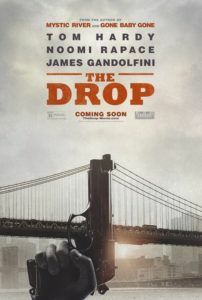 But The Drop, as it has been thankfully renamed, has moved from Dorchester to Brooklyn, where the city’s setting plays less of a role than the rich characterizations delivered by the excellent cast. Beyond housing the late James Gandolfini’s final screen performance, the film serves as another reminder of Tom Hardy’s vast range. And here Hardy delivers another performance like those in Warrior or Lawless, where he disappears into his character’s sensitivity and inner complexities, while fine players including Noomi Rapace and Matthias Schoenaerts support him. Lehane adapts and expands his own story that centers on a tavern called Cousin Marv’s, where Bob Saginowski (Hardy), a soft-spoken, working-class guy, tends bar. Marv (Gandolfini) used to own the place, but he’s just an unenthusiastic figurehead now since it was taken over by Chechen mobsters, who use this and other watering holes throughout the city as one-night-only depositories known as drop bars. On any given night, Cousin Marv’s might be chosen, and throughout the evening, shady men carrying thick envelopes of cash, collected for any number of illicit deeds, pass along the parcels that go into a hidden safe until a late-night pickup. Bob just keeps his head down and pours drinks, while Marv handles the money and grumbles, still embittered that the establishment bearing his name no longer belongs to him. Unbeknownst to Bob, Marv schemes to hold-up the place and get his due by hiring some inexperienced thugs. And while the robbers only make off with $5,000 from the register in the practice round, crime boss Chovka (Michael Aronov) wants his money back. As Marv and Bob sweat about paying back the Chechens, Lehane’s story veers into Bob’s life. He’s the kind of guy who goes to mass every Sunday but never takes communion out of some distant, hidden guilt. One night on the way home, he finds a Pit Bull puppy someone has horribly beaten and dumped in a garbage can. Nadia (Rapace), owner of said can, knows nothing about it and, having worked at an animal shelter, helps Bob get his bearings as a new pet owner. In his awkward, shy exchanges with Nadia and the animal, we see the obvious connection between Bob and his newfound friends, all of them scarred and desperately in need of someone they can trust. Bob remains a puppy-dog, honorable and compassionate, while Nadia might represent his sole hope for redemption. Unfortunately, local creeper Eric Deeds (Schoenaerts) begins hanging around Bob, claiming the pup, now named Rocco, belongs to him, and so does Nadia for that matter. 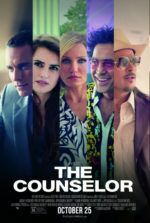 Meanwhile, Detective Torres (John Ortiz), who recognizes Bob from church, tries to piece together how the robbery of Cousin Marv’s and an age-old murder that’s long been linked to Deeds are connected. And Marv plans another robbery of his bar, this time on a drop night. As these seemingly separate pieces of the narrative converge with Bob’s puppy thread in a violent yet oddly funny climax, Bob grows into a richly complicated and underestimated character, almost to the extent of mythmaking. At one point, when the $5,000 is anonymously returned to Cousin Marv’s along with a robber’s severed arm, Bob maintains his cool as he wraps it up for disposal, hardly rattled by the sight. Such clues into Bob’s elusive past, such as his former days in Marv’s “crew”, slowly build into an overwhelmingly satisfying finale, despite the film’s overt use of a puppy to sway our sympathies. But then, without Lehane’s corny original title, the film’s themes become less underscored and quite endearing. Never confiding in anyone and content that a person’s past is their own business, Bob is a fascinating mystery in Hardy’s hands and not unlike a Pit Bull—capable of violence and maybe even best avoided, but a devoted companion if treated well. In that respect, perhaps the Nadia character seems underdeveloped; though she, too, is a wounded animal in need of rescue. 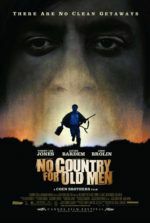 Further exploring how she and Bob find and need each other could have built upon the picture’s light romantic elements, but The Drop’s gritty crime base prevails, presenting Bob as an intricate enigma whose dimensions are carefully preserved in Hardy’s performance, which will only be better appreciated in subsequent viewings. And as much as this critic would like to say that Gandolfini’s final farewell is a show-stealer, his performance finds a perfect equilibrium with his costars and reminds us how, despite appearances and his iconic roles in the past, Gandolfini could measure his own presence. Overall, Roskam avoids oversaturating the film’s themes and achieves a solid balance between its powerful performances and involving narrative.